It’s only one year old but the Specialized Camber 29 is already under the knife. Changes to the range aren’t purely cosmetic, either, with the much-loved 26in Camber being axed altogether from the 2013 line-up. Killing off such a popular bike is a bold move, but US sales of short-travel 26ers have been dwindling, so the writing has been on the wall for some time. With somewhat sizeable shoes to fill, the alloy Camber 29 has been re-engineered from the ground up. We headed to Bend, Oregon, to try it out on a maze of dusty, flowing singletrack, and drown our sorrows for the loss of a dear friend. The most obvious difference on the new M5 aluminium Camber frame is the revised shock link. Rather than being attached to the underside of the seatstays, the link is now anchored to the end of the stays, with a shock yoke straddling the kinked seat tube. This transformation sees the alloy Camber moving away from the suspension layout of the Epic to take on a more Stumpjumper-like appearance. The amount of travel on the Camber, however, remains unchanged at 110mm, and it’s the only bike in the Specialized range on which the seatstay, shock yoke and suspension link all share the same pivot. Specialized claims that this co-pivot design dramatically reduces stress on the seatstays and, combined with revised tubing profiles, the result is a 26 per cent increase in torsional stiffness. We have no way of confirming how accurate these numbers are, but the difference in feel was immediately apparent. To make suspension set-up easier, all Camber models now sport the AutoSag feature first introduced on the 2012 Stumpjumpers. The alloy Cambers use a RockShox Monarch RL rear shock, but the set-up procedure is identical to that on the Fox-equipped carbon Cambers: overinflate the shock, sit on the bike, then release the excess air pressure via the AutoSag valve. Setting the rear suspension sag couldn’t be easier. A neat feature on the RockShox AutoSag valve means the dust-cap doesn’t screw off fully, but once loosened acts like a pressure-release button. Not only does this mean that you can’t lose the dust-cap, it makes it easier to release the air if you’re wearing gloves. With just a rebound dial and a lockout lever, it’s relatively easy to find your way around the adjusters on the Monarch RL rear shock. We ran the rebound damping in the fully open position, but the shock still felt a little sluggish and slightly over-damped compared to the Fox unit on the current Camber Comp. So while the new bike definitely feels stiffer, and possibly even more stable, it’s not quite as lively or as playful in character as the current version. Hopefully, for production, Specialized and RockShox can breathe some more life into the rear shock. The new M5 aluminium Camber frame also has increased standover clearance — it’s a full 10mm lower than the current 26in Camber frame. According to David Allen, the engineer in charge of the M5 Camber project, lowering the frame-height presented a unique problem on the size small frame. Namely, the dials on the fork hitting the underside of the down tube at full steering lock. Rather than manipulating the down tube further and increasing stress on the head tube junction, Specialized simply added bump-stops to the size small. They use the same anchor point as the upper cable-guide on the underside of the down tube and can be easily replaced if damaged. Our medium size bike had no such issues, but the compact frame design meant we were forever knocking the lockout lever on the shock to the ‘on’ position when removing the water bottle. Fortunately, Specialized makes dedicated left and right-hand bottle cages, so you could choose one that always flicks the lever to the open position. Or simply use a smaller water bottle. Specialized has six models in the 2013 Camber range, including a carbon Evo version, but we’ll only get to see three of those bikes this side of the pond: two alloy models, Camber (£1,500) and Camber Comp (£2,000); and one carbon model, Camber Comp Carbon (£2,500). 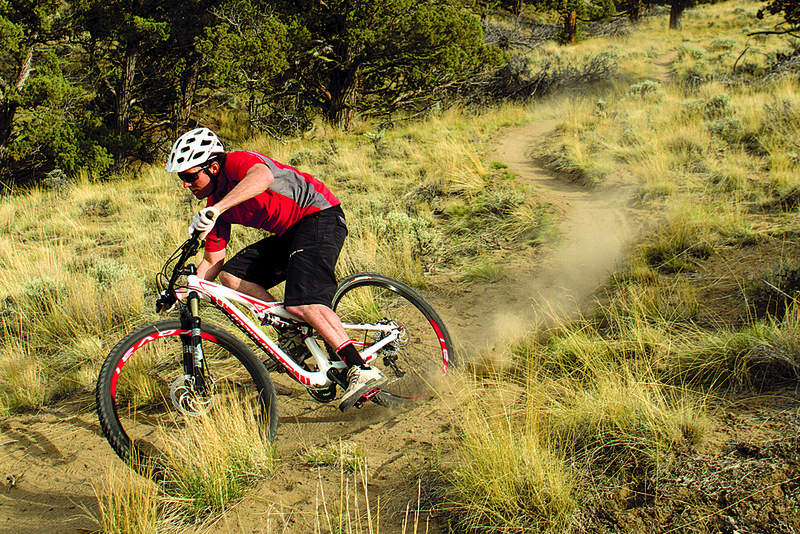 To help fill the void left by the 26in version, Specialized has restructured the pricing of the 2013 Camber. The new 29er-only range will start at £1,500 instead of £2,000, and Specialized has even managed to match the weight of the 26in Camber too. We’ll drink to that! This review first appeared in the New For 2013 series in the August issue of MBR, alongside the Stumpjumper Expert Evo, Shimano Saint groupset, SRAM xx1 drivetrain and Commencal Meta SL Ltd.